Every film has a story. 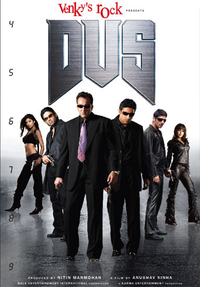 Dus is a film riding high on self-confidence. One walks into a multiplex expecting 'Dus' to be an ideal popcorn entertainer with an ample share of thrills, action, excellent music and tons loads of attitude that would make for an ideal weekend watch. Presence of Sanjay Dutt and Sunil Shetty with current favorite Abhishek Bachchan teaming up with hyperactive Zayed Khan are only some of the factors that make you settle down. The lights go off, the camera is on, and title song 'Dus Bahane' begins! A perfect start, one wouldn't have imagined a better kickoff to one of the most awaited movies of the year.